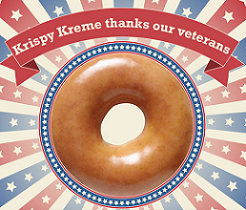 Get a FREE Doughnut and Coffee at Krispy Kreme for Veterans and Active Duty Military on November 11, 2014. No purchase necessary. No coupon required. Limit one offer per guest per visit. Valid in store only. Not Valid with any other offer. Not valid at grocery or convenience stores. Customer pays any sales tax. Void where prohibited. US only. Offer not valid at CT/Casino locations. Krispy Kreme will celebrate Veteran’s Day on Tuesday, November 11th by offering a Free Doughnut (any variety) and a Small Coffee to all Veterans at participating Krispy Kreme locations. No purchase necessary. A free doughnut and small coffee will be given to anyone who identifies themselves as a veteran or active duty military personnel (no ID required).